SAO MIGUEL, Azores -- After enjoying a superb 10-day food festival here the last week in June, we ventured out of the city of Ponta Delgada, capital of the nine islands of this archipelago, to explore the rest of the island. But before leaving this seafood mecca, we had to fortify ourselves with just one more incredible meal. We left the sparkling new harbor section and headed a few blocks away into the oldest part of town, which used to be right at the edge of the water where all the fishermen came in to eat. Restaurant Cervejaria Sardinha looked like a combination pizza joint and beer pub, mostly running takeout lunches to people outside the crowded facility. It was loud and not very pretty. What to the tables of the locals who stayed inside, however, was a tempting and intriguing look into the "simple" cuisine of the Azores. Fish broth -- the richest soup you can imagine, with typical Azorean spices -- was a first course. Then plates full of roasted tuna, little grilled horse mackerels, pock cutlets braised in wine and so tender you could eat them with a spoon, the typical Azores white cheese in a red pepper paste and a combination of roasted peppers, oranges and mushrooms, filled the tabletop. Then waiters added vino de cheiro, a red wine mixed with fruit juice, that tastes like sangria. Around the oldest streets in town we see the results of Sao Miguel's graffiti artists, who come at the invitation of the city, to paint their art on the walls. Like the graffiti of American artist Shepherd Fairey, which has been shown in Boston's Institute of Contemporary Art, the street art is not only welcome, but part of the lure for tourists and paid for by the tow. The graffiti makers are asked to "walk and talk" about their paintings here on a regular basis. Stone walls define plots of corn, tobacco "drying houses," lakes, and eight different shades of green, depending on what's growing in what plot. In Furnas we stop at the beautifully restored Terra Nostra Garden Hotel, which sits beside an enormous 18th Century botanical garden containing more than 600 specimens of camellias; trees from North America, Australia, New Zealand, China and South Africa;; grottos and canals and lakes and a strange brown swimming pool which, when we questioned the color, learned that it has so much iron in it that people swim here to feel its soothing benefits to their joints and muscles. In 1775 Thomas HIckling, U.S. Consul to Sao Miguel, had his elegant summer home built on this land. Now the mansion serves as a pool house. Azoreans are resourceful. When all of their orange trees were destroyed by disease some years ago, they bought tea plants from Brazil and now have thriving plantations on the north coast of Sao Miguel, which happen to be the only tea producers in all of Europe. Among the products from their tea comes green tea pudding, ice cream, cookies and liqueur. The Portuguese philosophy is: if you do't have oranges, make tea. Along those lines, a new business began recently in Lisbon called "Fruita Feia," or "Ugly Fruit." A clever businessman, noting that a lot of fruit that is not perfect to look at tastes just as good as the pretty fruit. So he sells it as ugly -- but delicious -- bargain fruit. Likewise, in Sao Miguel, they have ugly restaurants that produce beautiful food. Do not judge a book. . . The same resourcefulness comes from their pineapple hothouses which produce that fruit all year long and from which they make jams, liqueurs and sweets. The island has 230,000 extinct volcanoes and a few live ones. Residents make use of the heat of some of the hot springs from the latter to cook corn on the cob, among other foods. They sell it at roadside stands as if it's hot dogs. One of their natural cold springs produces a constant stream of chilled sparkling water, which locals collect into bottles they've carried from home. They know they're lucky that they'll never run out of the Perrier-like delicacy. 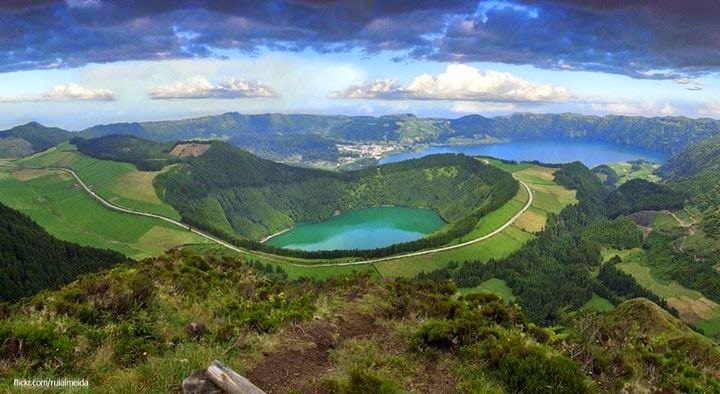 You could spend days in the Natural Park of Sao Miguel and hike, or bike, or horseback ride, around the beautiful Blue Lake/Green Lake of Sete Cidades volcanic crater on the west side of the island. It takes about a day to walk all around the lake and on the way you'll see migratory birds such as grey heron, common teal, and black-tailed god wit. A few small restaurants can provide a lunch if you make the day-long hike. Another walk around seven lakes nearby takes 2 1/2 hours. The lake district may be 500,000 years old, but many of the activities you can enjoy here are up-to-the-minute sports: golfing on the two courses, diving, whale watching, big game fishing, paragliding, surfing and body boarding, caving, quad biking or mountain biking, canoeing and perhaps hanging out at a spa afterward. If you fly from Boston to the Azores, you enjoy the quickest possible trip from the U.S. to Europe: a mere four hours.